Are you looking for super cute ideas that you can make for Easter Basket Fillers? 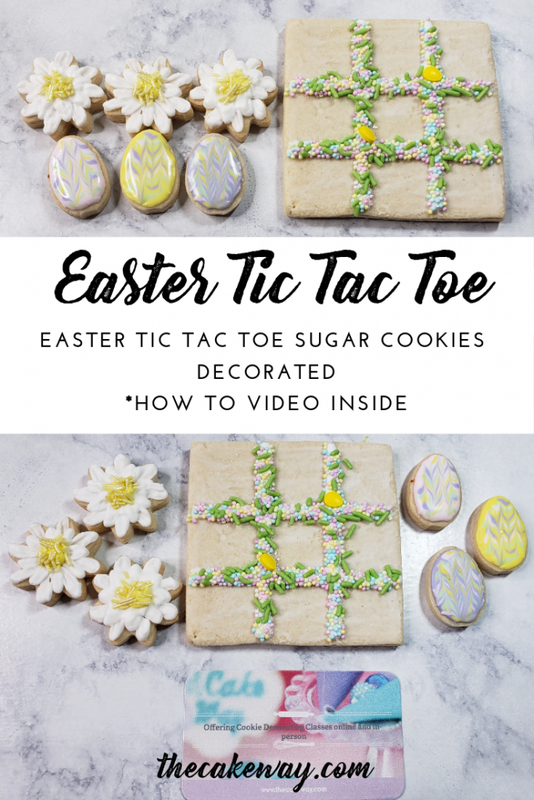 If so, then you certainly don’t want to miss out on this Tic Tac Toe Easter Cookies Decorated Set. I’m sure by now you’ve noticed that the cover photo for this set only has six of the ten playing pieces. While I certainly baked all of the necessary pieces, they somehow went missing between the time that they were baked and the time that they were to be decorated. I have a pretty good idea of the culprits though. A duo of cookie thieves that happen to live in my house. Boy cookie thieves ages 2 and 4. I remember playing Tic Tac Toe with my brother as a child, and I still play it occasionally with my family; especially when we’re out at a restaurant waiting for our food to arrive. These simple little mini cookies are so cute and easy to decorate. And even better, if you need a little help in the decorating area; watch the preparation video below. The video links to my Facebook page where I decorate cookies and create fun little edible desserts weekly. Would you like a reminder of when I’m going LIVE? I only send weekly reminders of the upcoming LIVE approximately 15 minutes before it starts through this link, so no worries. I won’t bug you incessantly, LOL! The tools and supplies necessary to recreate this set can be found here. Just click the link to directly download the supply list. If you’re a serious decorator. Don’t forget to check out the Cookie Decorating Tools here for more handy tools that I highly recommend. Do you need a sugar cookie recipe? Try this one! It’s my tried and true recipe! Comment and let me know how you like it!